Figure 1: Paul’s Cross, from 50 feet. From the Visual Model, constructed by Joshua Stephens, rendered by Jordan Gray. The sound of Donne’s voice is of course lost to us. The greatest challenge of the Virtual Paul’s Cross Project has been to decide how to represent that style, in the absence of hard evidence as to how Donne sounded. Nevertheless, as in other aspects of this project, the fact that we do not have a live recording of Donne preaching does not mean that we know nothing about how Donne sounded when he preached. There is the matter of audibility and clarity of expression, especially important when preaching in an outdoor space where members of one’s congregation could stand up to 150 feet from the Paul’s Cross Preaching Station. 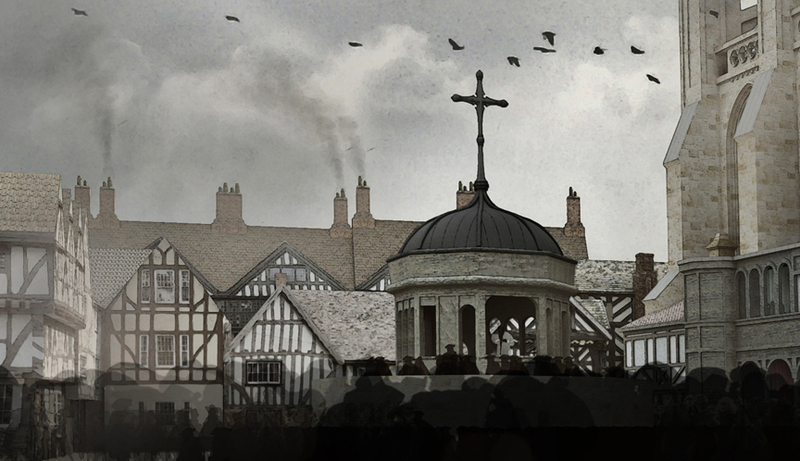 When Ben Crystal took on the task of recording Donne’s Gunpowder Day sermon for 1622, he was told that audibility and clarity of expression were major concerns of the Project. As a result, he spoke loudly, strongly, and with a very deliberate pace. People who hear Ben’s recording of Donne’s sermon for the first time say that the pace seems slow, even ponderous, a response, I am told by Ben Markham and Matt Azevedo, our acoustic engineers, that is a result of our being accustomed to the artificial naturalness of amplified speech. In fact, Ben’s pace and volume are perfect for the site, working with the reverberations provided by the surrounding buildings to extend the theoretical range of audibility from about 90 feet to over 140 feet. Donne was a frequent and experienced preacher at Paul’s Cross, so one would expect that he, too, found a pace and volume like that used by Ben Crystal to be appropriate for the space. That is, of course, if the sizes of crowd that came to hear him preach filled the space of Paul’s Churchyard; if his congregations were smaller, he might have gotten by with a softer voice and quicker pace of speaking. Moving away from what we can learn from the environment for preaching at Paul’s Cross to what we do know about Donne’s personal preaching style, we can learn from the small number of descriptions of Donne’s preaching that do survive. The Virtual Paul’s Cross Project reminds us that Donne’s preaching was not the univocal delivery of a lecture to a passive quiet, cognitively attentive audience but an interactive performance delivered on a specific occasions for specific congregations, in a format that was shaped by performer’s and hearers’ expectations about the event, and by their interactive participation in the event. Donne preached for an audience well-experienced in sermon-going, with a high regard for the quality of performance, for the techniques of delivery, the techniques of text-handling, of division and application. Holding their attention must have been a major concern, both through cleverness of content and through skillful delivery, skillful performance of the roles of priest, prophet, spiritual guide, interpreter, model and enabler of transformation. The occasion of the early modern sermon had the potential to change its participants, to – from a pragmatic perspective – provide an entertaining way to spend time on a Sunday morning, create an occasion for a large social gathering with one’s neighbors, or advance a clerical career. This occasion could also provide – from a theological perspective – an occasion that could change lives, advance the general welfare, promote social cohesion (especially promote support for the monarchy), and open the way to eternal life. So Donne’s preaching was but one part of a collaborative experience, an experience that results from the encounter of occasion, preacher, and audience, a negotiated experience through which tradition, expectation, intention, and response merge into a one- or two-hours traffic upon the pulpit. In this case, Donne’s role would be the role of priest, prophet, spiritual guide, interpreter of the biblical text, enabler of the behavior or life that leads one to eternal joy. Contemporary accounts of Donne’s preaching often use impressionistic language that is not very helpful; Walton’s description of Donne’s sounding like “an angel from a cloud,” for example, does not give me much to go on. Other accounts are more helpful, however. Donne sought to engage his hearers, to change his hearers, to bring them – through both cognitive and emotional means – to amend their lives in directions set out by Donne in the sermon. Donne once described the performance of an effective preacher in terms of a coordinated effort of body, feeling, and ideas, uniting “matter and manner,” the quality of the voice (“pleasant”) and personal manner (“acceptably, seasonably, with a spiritual delight”), with “a holy delight,” toward the goal of “profit” for his congregation. Still others make clear that while Donne was emotionally open in his preaching, and able to move his congregations emotionally as well as cognitively, he always displayed restraint and decorum appropriate to his place as a preacher and his office as the Dean of St Paul’s Cathedral. Accounts of Donne’s style of delivery support a characterization of Donne’s preaching style as multivocal, varying in mode of delivery from section to section of the sermon, if not moment to moment of his delivery, depending on the content of each passage and its relationship to the overall structure and argument of the sermon as a whole. Donne could, I think, be analytic, discursive, informal, witty, joking, engaging, declamatory, and affective, depending on what part of the sermon he happened to be in at any moment of delivery, using a style of verbal delivery appropriate for the kind of material he was covering at that moment in the section of the sermon he happened to be in and appropriate for the kind of effect he hoped to have on the audience at that particular point in the sermon. Donne’s sermons were delivered in an energetic, engaged, empathetic, emotionally expressive, responsive, evocative speaking style, or, better, range of styles, always aspiring to intimacy, to engagement, sometimes confrontational, sometimes laudatory, always lively, engaging, personable, and connecting with his congregation. He did not read his sermons as one would a formal lecture, but performed them as one would a public oration, or, perhaps better, performed them as one would perform a character or a role in a play, in the play of social role and participant in society. As we have commented before, his sermons were performed from notes that guided his delivery, so, while the structure of the sermon was worked out in advance, the actual words were improvised in process, responsive to external elements like the regular sounding of the clock bell or the irregular responses of the congregation to this or that point, or gesture, or distinctive passage. Donne preached with special regard and concern for engaging the audience, addressing both their minds and their emotions, connecting with them at multiple levels, aware both of the need to inform them but also to delight them so as to move them toward changes in belief and behavior. The course of a Paul’s Cross sermon – about 2 hours – requires commitment to keeping the congregation awake, alert, engaged, responsive, and focused on the words of the preacher. This surely required a variety of tones of voice, styles of delivery, modes of address, and a range of emotional energy and cognitive development. This much we know. What we don’t know, of course, except in the most general terms, is how Donne’s congregations responded to his preaching. If Donne’s comments are any indication, they responded actively, vocally, engagingly, accepting responsibility for their side of a cooperative, interactive, corporate performance. We do know that certain kinds of audience response were scripted, for example the congregation’s joining in the Lord’s Prayer at the end of Donne’s opening prayer. If I am right that the event drew on models from the Book of Common Prayer for openings and closings, then congregations responses like the phrase “And with thy Spirit” as the reply to “The Lord be With you” were also scripted. The specifics of the congregation’s performance in response to other parts of the sermon are is of course lost to us; the one way we may glimpse them is through exploring possibilities for Donne’s performance, noting places where he invites, even incites, certain kinds of response. Starting from the accounts of Donne’s preaching style, reviewed above, we can suggest portions of his Gunpowder Day sermon that seek or invite certain kinds of response. The version of Donne’s Gunpowder Day sermon for 1622 at the center of the Virtual Paul’s Cross Project performs one set of possible modes of delivery. Ben Crystal’s performance ranges from the witty to the expository to the instructional to the argumentative to the exhortative to the incantatory; the program that enables us to hear his performance of this sermon inside the acoustic model of Paul’s Churchyard also draws on a set of recorded crowd responses, so that as the speaker’s voice becomes more energetic, the congregation responds in kind. This is not offered as “the way it was,” but instead is designed to remind us, always, that the congregation is present, engaged, responsive to the preacher. Here are some examples of moments in Donne’s Gunpowder Day sermon that suggest a style of delivery that invites specific kinds of congregational response. 1. Scripted address and response; here the tone of response tends to echo tone of address. The Lord be with you./ And with thy Spirit. This is the day, and these are the houres, wherein that should have been acted; In this our Day, and in these houres, We praise thee, O God, we knowledge thee, to bee the Lord; All our Earth doth worship thee; The holy Church throughout all this Land, doth knowledge thee, with commemorations of that great mercy, now in these houres. Now, in these houres, it is thus commemorated in the Kings House, where the Head and Members praise thee; Thus, in that place, where it should have been perpetrated, where the Reverend judges of the Land doe now praise thee; Thus in the Universities, where the tender youth of this Land, is brought up to praise thee, is a detestation of their Doctrines, that plotted this; Thus it is commemorated in many severall Societies, in many severall Parishes, and thus, here, in [the shadow of] this Mother Church, in this great Congregation of thy Children, where, all, of all sorts, from the Lieutenant of thy Lieutenant, to the meanest sonne of thy sonne, in this Assembly, come with hearts, and lippes, full of thankesgiving: Now, in these hours . . . These considerations, will, I thinke, haue the better impression in you, if we proceed in the handling of them, thus. First, the maine cause of the lamentation, was the ruine, or the dangerous declination of the Kingdome, of that great and glorious state, the Kingdome. 4. Witty and playful passages inviting laughter, establishing a sense of being an insider, part of a community with the preacher. Euery where the king is Sponsus regni, the husband of the kingdome; and to make loue to the kings wife, and vndervalew him, must needs make any king iealous. 5. Energetic, emotionally charged passages, inviting emotional response, here a sense of outrage at what was done, or attempted. 6. Instructive, directive passages, drawing conclusions from the arguments that have implications for the congregation, inviting reflection, agreement, assent to the argument. Looke thou seriously to thine owne dores, to thyne owne family, and keepe all right there. A theife that is let out of Newgate, is not therefore let into thy house. A preist that is let out of prison, is not therefore sent into thy house. Still it may be felony to harbor him, though there were mercy and benignity, to let him out.